Are you going to the Macon County Fair? This is my absolute favorite time of the year - those few weeks between summer and fall where the greenery is still lush but the air is starting to get cool at night. Tallent's Produce has just received their shipment of unique pumpkins and gourds, and everyone is happy to see the pumpkin spike latte on the menu at the local coffee shops. Ahh... life is good. One highlight of September for me is the fair held at the Wayne Proffitt Agricultural Center. What is it about a small-town fair that is so special? Watching the kids show off their prize animals, race in the pedal tractor pull and eat cotton candy - it just makes me feel like a proud and happy American! I'll be manning the booth for the Smoky Mountain Quilters Guild from 5-7pm on Saturday, if you'd like to come by and say "hi", I'd love to see you. 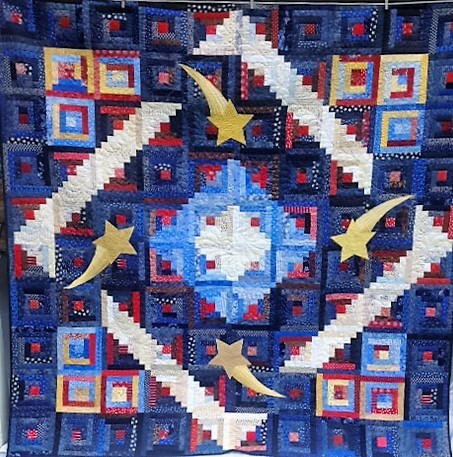 We'll be selling raffle tickets for the amazing "Catch a Falling Star" quilt pictured above.